There are more options than ever for anyone deciding to custom print t-shirts at One Hour Tees. We offer full direct to garment printing, both light and dark, as well as embroidery for all the garments we sell. However, there is still a high demand for the more traditional option or method of screen printing T shirts. Understanding the advantages can help you to decide if this is the right method we should use for your order. 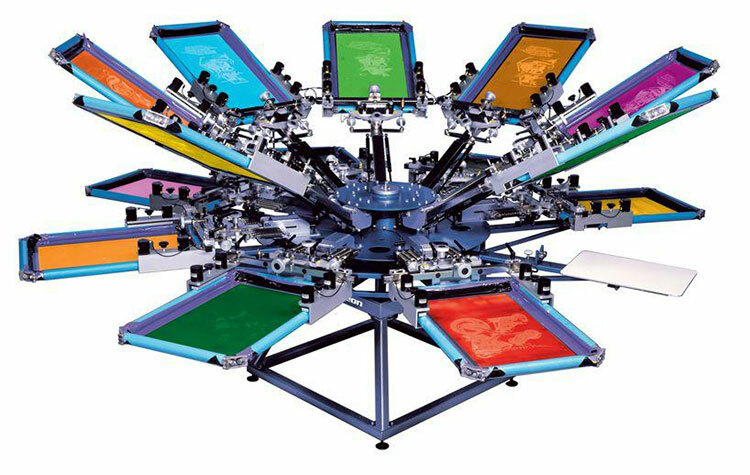 One of the most important things to keep in mind with screen printing T shirts is the high visibility and bright, vibrant colors and images you will see. This method uses a thicker ink that will not be absorbed into the fabric of the shirt as you find with direct to garment printing. The ink will remain on the surface of the shirt, but will bend and flex with the shirt. This slightly raised ink gives a texture and feel to the printed areas of the shirt, which is very distinctive to the process. 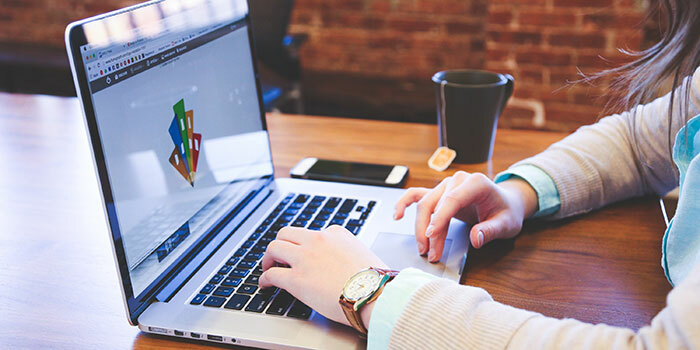 In addition, with only one or two colors, it is easy to create a very visible and crisp looking image, graphic, or logo on the design. Since the ink is not absorbed into the fabric, it can be done with virtually any color of shirt. Of course, choosing a tee shirt color or the colors for screen printing that contrast and stand out is going to be part of creating this look. For multiple shirt colors in an order, or for a variety of different options, screen printing T shirts is the best possible choice. One design and process can be used for all colors, making the process easier and quicker. Keep in mind we don’t charge for design setup for orders of over 10 items or when you order a text only single font print. 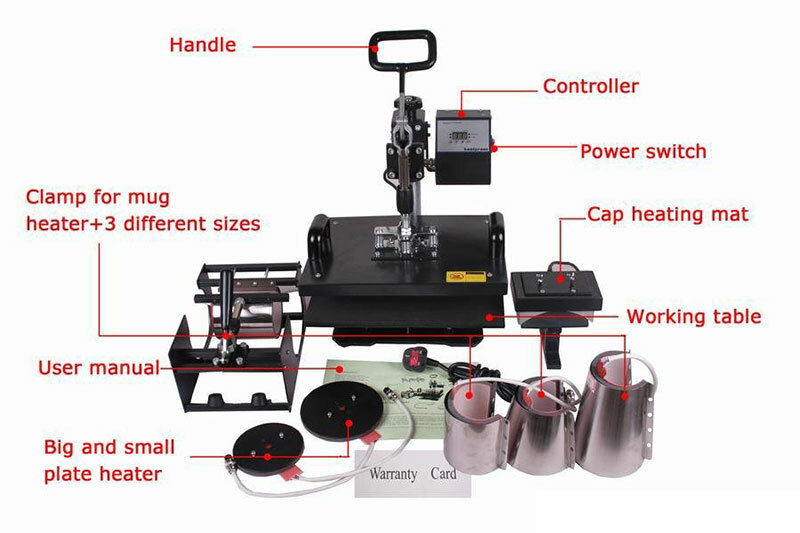 The result of using the screen printing process on tee shirts and other garments is a very professional looking design. These are great for businesses and companies for staff shirts, and also make great promotional items for customers and clients. They are also an excellent choice for sports teams, groups, and organizations. Our quality shirts and exceptional screen printing services make a great choice for larger orders when you want a traditional looking customized shirt. When you want to have a design placed on fabric, you are faced with a myriad of possible choices. Yet, two of the more common ones today are also among the oldest forms of printing. They are embroidery and screen printing. Both are popular; both have their advocates, but each should be employed in specific instances. Embroidery has been used for thousands of years. It is one of the oldest methods used to put a design on fabric. It is also among the simplest. It simply requires a needle, thread, and the surface upon which to stitch the design. 3.Sewed or stitched (embroidered) the design carefully onto the fabric. In some instances, you actually had to dye the threads and cloth before you began the slow but exacting process of recreating the design on the fabric. The invention of sewing machines made the process easier, but the work is still considered to be very precise. The look is perceived as being classic and even classy when compared to other forms of printing on fabrics. The raised surface provides the design with a 3 dimensional look that appeals to those who want their graphics to come alive and/or the text to leap off the fabric. Yet, technology also saw to the production of lightweight material that can not withstand embroidery work and has limited applications in items such as T shirts. If you decided to wear a T shirt that had been embroidered extensively, you would find yourself having issues. The material would not hang properly and could possibly pucker unattractively. Tearing is also possible because of the weight of the threads on the lighter material. If you are looking for a T shirt that acts as a canvas for your design, you are more likely to consider screen printing. This is particularly true for large runs of items. You can cover the back, the front, and use the sleeves inexpensively for large lots. This makes for affordable team or group T shirts that you can order in bulk. Screen printing allows you to look more relaxed or even casual. This is, after all, what T shirts are made for. With screen printing, you can easily add a logo, design, text, or graphics on almost any garment – although it works best with cotton and other sweat shirt material. However, it is the most highly recommended method for T shirt decoration. The screen printing of T-shirts is both a science and an art – just ask the experts at OneHourTee and other companies. It requires skill, as well as finesse. It also demands that attention be paid to detail. When we are shopping for the right t-shirt, or looking for someone to provide us with that perfect product, it always pays to understand exactly what is required of someone or some company that does screen printing. Screen printing, or serigraphy, is a process through which an object – often fabric, but also paper, metal, china or plastic– is decorated with graphics, a logo, or printing. It accomplishes this by pressing ink through a woven screen or mesh. Areas of the screen are blocked off using a stencil. This allows the application of different colored thick ink to penetrate the material. The result is an image or wording that has a raised appearance. When screen printing T-shirts, a company is providing you with the most common method used to date to produce work on a commercial basis. Yet, surprisingly, the technique is not new. It dates back more than two centuries, specifically to China, where they created a screen using human hair and a wooden frame. The stencil comprising the design consisted of leaves. The Japanese made an improvement on this method by replacing hair with woven silk from silk worms. This resulted in the name by which we know it today: silk screening. However, printing T-shirts was not part of this process until the 20th century, when Samuel Simon of Manchester England (1907) registered the first commercial patent for the process. His work, together with that of San Francisco’s John Pilsworth, laid the basics for what was to become a thriving industry. Since then, the process has evolved, with more technology for creating newer methods to perform this old skill. Plastisol, discovered in 1959, added a new and more durable and pliable ink. It became one in a series of trendy inks that have come in and out of fashion, particularly when it comes to screen printing T-shirts. We may opt for metallic ink, consider a certain image or logo our favorite, and change our minds about whether this or that design sends an appropriate message. Yet, we no longer marvel about how technology has changed the process so that it no longer resembles its origins. Still, the overall intent and technique remains the same. The more we change, the more the procedure adapts to produce what it was intended to do in the first place: create and recreate a design for us to appreciate, discuss, and reflect upon. If you’re considering purchasing custom made shirts for an event or a team, you should understand the possible methods used to get what you want. With computer technology adding to the older existing methods, you now have many choices. Which type will work best will depend upon several factors, including what you want done and which method a professional printing company like One Hour Tees offers. This is by far the most common way used to create custom made shirts, and it’s perfect if your design only requires a couple of different colors. It is also for those who want their design or lettering to have a raised feel and appearance. The advantages of this method for any producer include speed and cost-effectiveness. You will be wowed by the durability of the imprinted designs, as well as the vivid colors. If you have a dress, shirt, hat or jacket on which you want to place a specific image or lettering, companies such as One Hour Tees suggest a technique called embroidery. This is either done by hand, or by using a specific machine. T-shirts may pucker as a result of the process, which may limit the bulk production of custom-made shirts. The cost is also a factor in reducing its overall popularity. Nevertheless, if you want something embroidered, it can be done. Simply stick to smaller designs. Alternatively, ask whether you can combine this method with silk screening to achieve a unique design. Dark Direct to Garment Printing: This is an expensive form of DTG printing, and a variation on light DTG digital printing. It can successfully achieve a colorful image on a black t-shirt without the use of appliqués or iron-ons. Light Direct to Garment Printing: It does not use white ink, and it is best if you choose light colored custom made shirts. The color choices are amazing and very numerous. Unlike with a few other methods, DTG custom made shirts do not crack or peel as time passes. The ink remains solid as it is embedded into the fabric of the shirt. If you have an image in mind, one that is readily and commercially available, one of the more common methods to transfer it to custom made shirts is through heat transfers. Heat and pressure are the basic requirements to successfully transfer the image. If this is a method you’d prefer, first make sure you or your company chooses an expert in the field. The results can vary, and you could get crooked images and wrinkled t-shirts resulting from someone who is less than professional. If you’re planning on a single design, or want to create a uniform look for a group by applying a log or image to custom made shirts, consider and weight your options. Be sure to talk to someone who knows the different methods, such as the professionals at One Hour Tees. Listen clearly to what is said, do your own research, and only then go ahead with your plans. If you love custom shirts and want to do a few on your own at home, it isn’t impossible to set up a simple screen printing system. However, and just to be clear, it isn’t going to be identical to what we use because we do our shirts on a professional quality automated system. The ideas and the concepts are still the same and if you are patient, willing to practice a bit, and have a good eye for detail, this can be fun thing to do. It is going to be messy, we are warning you right from the start, and you will need to buy some special supplies before you get started. Do you happen to be part of a ragtag group of hockey players without talent, a coach, or even proper gear? Or on the other side of the fence—maybe you’re the team with ridiculously talented players (probably from Iceland), obnoxiously evil, always beating the underdogs? Whatever your team’s story may be, there’s one thing you both have in common. Nope. It’s not Adam Banks. It’s the need for a seriously awesome uniform. As any sports team can testify, having numbered jerseys with the player’s name is a must. I mean, are you even a real team without them? What else really binds a group of passionate sports lovers together like putting on those sweet, professional looking jerseys for the first time? That’s right. Nothing! At OneHourTees, were happy to help out both the underdogs, the evil champions, and everyone in-between. How do we appeal to such a range of characters? By offering only the best high-quality custom vinyl lettering and numbering for your uniforms. What is Vinyl Lettering & Numbering? Essentially, vinyl lettering and numbering is a heat-transfer printing process in which your desired characters are cut out from a roll of colored vinyl and applied to your chosen apparel. It’s a fantastic, easy, and affordable way to create amazing, professional quality jerseys for your team or event in a flash. Unlike other printing methods, each individual design element is cut-out from a large piece of colored vinyl. When heated, this vinyl becomes incredibly adhesive. Once pressure is applied, the vinyl will bind permanently to whatever apparel it’s being pressed onto. Vinyl is a slower, more labor-intensive process so it’s ideal for smaller orders as the cost will significantly rise with the quantity numbers. The process to add custom vinyl lettering, whether it be a team name, player name, or numbering, is quite straight-forward with the right equipment. For high-quality vinyl printing, the right equipment means some heavy duty machinery. At OneHourTees, we only use the finest, top-of-the-line materials and mechanisms in the industry. Our customers deserve no less than the best looking uniforms on the field, on the ice, or after the game at Dairy Queen. The vinyl printing process starts by creating the lettering, numbers or other design on a computer. We then print and cut it out from a sheet of colored vinyl. Next, we image reverse the design as the characters will be placed face down on the jersey. This will ultimately cause the image to re-reverse once actually applied to the shirt. Then it’s time for the application. Our professional printers will precisely line up the design so it’s nice and straight on the shirt itself. A heat-resistant cover is placed over the vinyl design to keep it from burning or melting. Finally, the heat is on—literally—as we apply a super high-powered iron (definitely not the ones you’ll find at home) to heat up the bottom of the vinyl to the optimal temperature. With a massive amount of pressure, we press the heated vinyl onto the shirt and adhere it permanently to the fabric. Now, we wouldn’t blame you for thinking “Aren’t there are at-home products that’ll let me do the same thing for less using my dinky little iron?” Sure, but those products are often low quality and tend to peel very quickly. For vinyl lettering to adhere correctly, it needs an even amount of high heat, and a massive amount of pressure that even Arnold Schwarzenegger couldn’t apply alone. We’re talking hundred of pounds of pressure, and though these at-home versions might last for a game or two, ours will last without fading or cracking for years. OneHourTees guarantees the best custom lettering on the market. Our experienced technicians understand the importance of consistency when applying vinyl lettering. We also understand that if you really want to beat those Icelanders, you can’t have them laughing at your peeling, cracking at-home vinyl lettering. You’re the real deal now. Why Choose Vinyl Lettering vs. DTG or Screen Printing? So why should you choose vinyl lettering over our other printing processes like direct to garment (DTG) or screen printing? Though all of our printing techniques will provide high-quality custom designs made to last for years, they do each have their pros and cons. With vinyl printing, because each letter or number must be cut out from a single color roll and placed on the tee individually, 1–2 colors max are recommended, as are simpler designs. And since the characters are already all non-reusable custom pieces, it doesn’t make a difference if each letter or number is different, or they’re all the same. The price won’t change because the actual work per shirt doesn’t either. However, for methods like screen printing, significant setup time must be put into every single screen—which is how the ink is distributed onto the shirt. Once created, a screen can also be reused countless times. 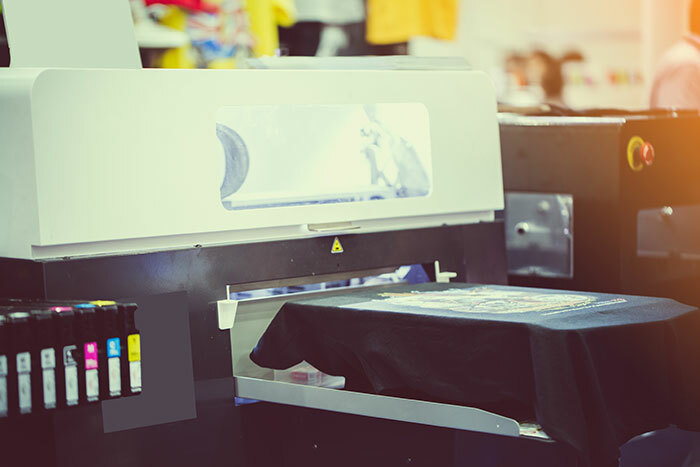 Because of this, printers typically require a minimum order of shirts to justify the use of each screen, and not spend a whole day screen printing the numbers 1–30 when we could do it in an hour with vinyl. If customization isn’t a priority, but a more intricate design is, then screen printing might be the right decision. Or if speed is what you need, check out our DTG printing process. You are more limited when it comes to the color of your t-shirt and the placement of your design, but like our name suggests, with DTG you can get have slick set of jerseys ready to pick-up in less than an hour from our Chicago store. Long story short—vinyl lettering is perfect for placing custom letters or numbers on your team’s jerseys. Want your team name proudly displayed on the front with each player’s name and number on the back? That’s perfect for vinyl! How about a multi-colored image of Coach Bombay’s face? Better look into DTG or screen printing. What T-Shirts Work Best for Vinyl Lettering? These are only a few of the hundreds of t-shirt options we offer. Explore what else we have on our products page. Prove your players are ready to go against the big guys by ordering custom vinyl lettering and numbering from OneHourTees. Perfect for everything from casual tees for your softball office crew, to the highest quality athletic wear for the pros, trust our vinyl designs to last for years— no matter how much action you put it through. 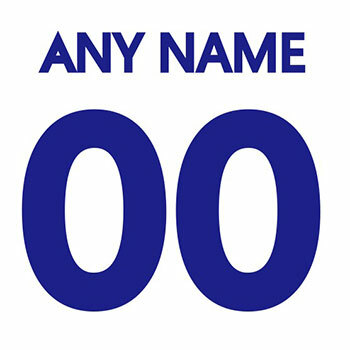 Want to learn more about creating custom high-quality vinyl t-shirt lettering or numbering? Don’t hesitate to contact us at OneHourTees. Give us a call at 773-687-0520 or get a free quote online right here. We’re committed to working with you and your team to find the best design for your shirts. Hell, we’ll even come to your game and cheer you on. We love a good game. What is Screen Printing & How does it work? Last week we told you about DTG printing. No big deal, it just allows us to act like super ninjas who can print any design you desire on a t-shirt in under an hour. What’s that? You think we’re wizards? Well maybe we are. Maybe we are. Because that’s not all we do. You’re thinking to yourself right now, “that’s impossible, t-shirts in an hour are already extremely admirable, what else can they do?” How about a little thing called screen printing? Hell yeah, we do that too. Screen Printing, which is also known as Silk Screening, is a badass method of printing graphics on a t-shirt using thick inks that lay on top of the shirt rather than soaking into the shirt. Screen Printing is what most companies use and, back in the day, was the only major way to create bulk amounts of custom t-shirts. OneHourTees offers Screen Printing, along with one hour DTG printing, because in some cases, it’s better to use Screen Printing over DTG. With thicker inks, screen printing is better for graphics with only one or two ink colors being used. Rather than DTG the screen printing will make these colors pop out at you like jack in the box. The thick ink will have a soft feeling if touched and can make for a really amazing look. If you’re in no rush and have minimal colors for a t-shirt, we recommend Screen Printing. It looks great and is often more affordable for larger quantities. So how does Screen Printing work? Well, it’s not like DTG that’s for sure. Instead, a thin mesh is stretched tightly over a frame (originally the screen was made from silk, however, mostly made from polyester today). A negative of the design is printed onto the screen to be placed against the shirt. Once set correctly, ink is rolled over the screen, only the areas where the design has been printed allows ink to slip through. The ink then sets on the t-shirt and is put aside to dry. We’ll be honest with you, it’s a lot more complicated than that. There’s a lot of separate chemicals, inks, and techniques that go into making your shirts, but that’s the jist. While it may not be as quick as DTG printing, it can result in a thick and bold design. No Seriously, How Does It Work? Ok, don’t say that we didn’t warn you. There’s a reason why silk screening turns out best when done by professional t-shirt companies such as 1 Hour Tees. Experience, know-how, and the right equipment all combine to make the perfect t-shirt. Here’s an in-depth overview of how we go about screen printing our t-shirts. Cue Discovery Channel’s “How It’s Made?” upbeat industrial-sounding music and let’s dive right in to the wonderful world of silk screening t-shirts. Once you’re A-OK happy with the mockup of how your shirt(s) will look, it’s time to get started. Try to mentally picture the screen on a screen door of a house. We use something like that (but much higher quality). It’s basically a screen with a bunch of tiny little holes. We take the screen (it’s secured in a wooden frame) and start to prepare it. It’s then covered in a layer of emulsion that will prevent ink from coming through. The end result is a two-tone color (green and the color of the screen which is usually a shade of yellow). The colors on the screen don’t matter and won’t affect the final printing process. We also handle some behind-the-scenes stuff to get ready for a print run. This overall set up for silk screening is much longer than DTG printing as we have to manually do everything by hand. This is where the wizardry happens. We take our custom colors and start mixing and matching until we have the exact colors that you specified. We only use high-quality inks that are designed to last a long time. The inks we use are also really thick, which means the design is going to come out looking really good. There really isn’t any more to it. We just follow the color-mixing instructions and in a few minutes, we’ve created the exact color that you specified. The press is where the shirt is silk screened. Picture a 12-armed metal beast from some mythical Viking tale. It spins around and there’s lot of metal parts. On each arm there is place where the wooden silk screen (that we designed for your shirts) is placed. The t-shirt is stretched over an ironing board looking device. Everything is lined up with frickin’ lasers so the design on all your shirts is located in the same position. The screens are then lowered on top of the t-shirt. We pour the custom ink concoction on top of it and then use a rubber squeegee to very quickly move the ink from one end of the silk screen to the other. As the ink gets moved over the screen, the t-shirt soaks up the ink on the front and the design starts to appear. Depending on what colors you wanted, we may have to mix colors (more wizardry) and the t-shirt may undergo two or more silk screenings using different colors (and a different arm of the 12-armed metal beast. The end result is a t-shirt that has the exact same design, and color that you wanted. We then dry our shirts in a dryer. It’s more of a conveyer belt type device that has been set to an exact temperature to ensure the shirts dry in one pass and the colors don’t bleed. Once the t-shirt comes out on the other end, we inspect it to make sure it looks exactly like the mockup we sent you earlier. Unlike DTG printing, silk screening is done completely by hand. This type of printing is deal for artwork that only has 1-2 colors or huge quantities. You can tell a t-shirt has been silk screened If you run your hand over the ink. It will have a raised feel to it. This is due to the ink being put on the front of the t-shirt. Due to the fact that silk screening is a highly custom job, it will take us 10 business days to create your order. Get Your Silk-Screened T-Shirts Ordered Today! We recommend screen printing for simple company logos, team names, and t-shirts with text. As well, screen printing works very well with both light and dark t-shirts. Often, DTG has a tougher time with dark shirts, but screen printing, as long as the right inks are used, will stand out compared to any other technique for t-shirt customization.